The Frozenbyte team is creating something completely out of this world. Now we’re looking for talented programmers to join us in our quest of re-defining high-end gaming experiences. 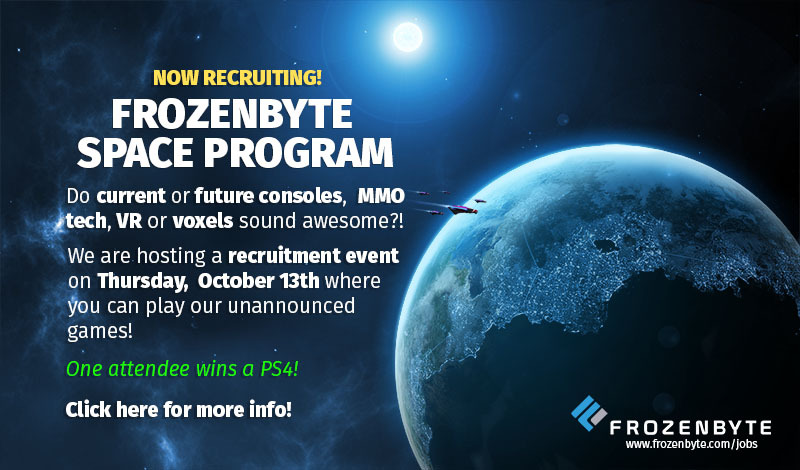 This October we are hosting a recruitment event where you can try our unannounced games and see why our goals are one of a kind. … and also accepting open applications to all kinds of programmer positions! The recruitment event will take place at our office in Helsinki on Thursday the 13th of October. At the event, chosen participants will get the chance to see and experience our unannounced games, and to meet our HR and senior programmers. Please note, that due to limited space (pun not intended) at our office, we might not be able to host everyone who’s interested – we’ll send out details for all who have been chosen to participate. So send your CV to [email protected] ASAP if you’re interested! If you can’t or don’t want to participate at the recruitment event, you can also just send us your job application & CV.